AWD with Instant Traction for enhanced ability  a world first The Volvo XC90 reinforces its position as one of the most successful SUV models in the premium segment. An entirely new powertrain featuring a V8 engine, 6-speed automatic transmission and the latest-generation AWD system further broadens the customer base for the Volvo XC90. The new Volvo XC90 V8 will make its debut at Paris Motor Show 23 September. The new V8 engine marks a new turning-point in Volvo Cars history. It is the first V8 the company has produced since it was founded in 1927, and the Volvo XC90 is the first model to be powered by the new engine. An SUV in the premium segment needs a V8, especially on the North American market where we sell about 60 percent of all the XC90s we make, explains Hans Wikman, Vice President, Vehicle Line Large Cars. One absolute requirement for the new V8 engine was that it had to be installed transversely in the engine compartment, just like all other Volvo engines. A transverse engine is helpful in maintaining the frontal crumple zones in the XC90 and thus not compromise on protective safety, says Hans Wikman. For this reason, extremely compact external dimensions were essential for the new engine. This also explains the choice of just 60 degrees between the two banks of cylinders  as opposed to the more conventional 90 degrees. The imbalance that is a natural consequence of a 60-degree V configuration between the banks of cylinders is prevented by a counter-rotating balancer shaft. V8 tailor-made for the XC90 In order to maintain overall compactness, all the ancillary units such as the alternator are fitted directly onto the engine itself without any space-stealing brackets. The starter motor is fitted above the transmission for the same reason. What is more, the exhaust camshafts are driven by secondary chains running off the inlet camshafts, saving additional space. The left-hand cylinder bank is offset half a cylinder ahead of the right bank, contradicting normal practice in the automotive world  so the engine can slot neatly into the structural beam network of the XC90 and thus enhance collision safety. Weve tailored this V8 specifically for the XC90, confirms Hans Wikman. The result is a V8 that is just 754 mm long and 635 mm wide  the most compact on the market compared to engines of equivalent volume. As a result of these compact dimensions and the fact that both the block and cylinder head are cast in aluminium, Volvos new V8 weighs just 190 kg  an important consideration when aiming for low fuel consumption. 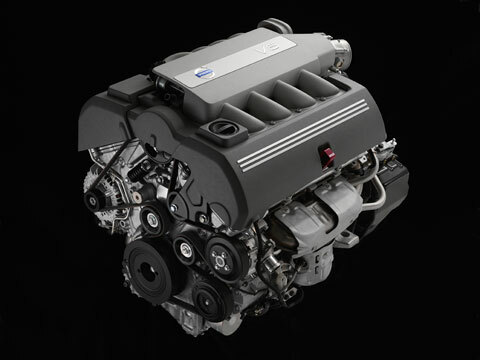 First launch of petrol V8 to meet ULEV II The new engine from Volvo is the cleanest petrol V8 on the market today. It meets the American ULEV II (Ultra Low Emission Vehicle, stage II)  which no other petrol V8 has yet managed. Four catalytic converters.Two of these are of Close Coupled Catalyst type and fitted to one exhaust manifold each. The other two are installed under the car floor. The result is extremely low emissions before the catalytic converters are activated  which takes place just 15 to 20 seconds after the engine starts up. It is during these 1520 seconds that the majority of the emissions of environmentally harmful substances take place, explains Jörgen Svensson. Distinct V8 sound The Volvo XC90 V8 produces 315 horsepower and its torque  the most important characteristic of a V8 engine  is a massive 440 Nm at 3900 r/min. And at the sort of revs at which most driving takes place, around 2000 r/min, no less than 370 Nm of torque is at the drivers disposal. To increase the low end torque, the Volvo V8 has a valve in the inlet manifold that is closed below 3200 rpm. In this mode the air flow between the two cylinder banks is cut off, which creates a broader and more even torque curve. We chose to give our new V8 a sporty yet sophisticated appeal, with masses of power in reserve even as the revs rise, explains Jörgen Svensson. Acceleration from 0 to 100 km/h takes 7.0 seconds and fuel consumption is 13.0 litres/100 km (preliminary figures). Top speed is limited to 210 km/h (190 km/h in the USA). The engine note is an important detail for buyers of a car with V8 power, and this is something to which Volvo Cars paid careful attention during the development of the new engine. In the hunt for that characteristic V8 rumble, it is the position of the inlet manifolds that is the main deciding factor. Our new V8 has just the right sort of charismatic off-beat V8 burble, but it is somewhat more muted in the European fashion rather than producing the more traditional meaty American throb.We feel this provides better audio comfort for the cars occupants, comments Jörgen Svensson. New 6-speed automatic transmission The power from Volvos V8 engine passes through an entirely new 6-speed automatic transmission dimensioned to handle the high torque. This unit too is of particularly compact dimensions so as not to interfere with the cars overall structure. Sixth gear is a pure overdrive ratio to ensure quiet cruising and low fuel consumption. We get simply massive take-off force with this auto transmission, says Jörgen Svensson. The new 6-speed transmission is of Geartronic type, which means that it can also be shifted manually. There is also a possibility for Lock-up, and slipping Lockup, on all gears. To ensure the optimum balance between driving properties, performance and fuel consumption the engine and transmission are treated as one unit. This is achieved with new software developed by Volvo, called CVC (Complete Vehicle Control). CVC is part of the integrated software package used, both in the engine control module and the transmission control module. Among the many benefits of this approach was the possibility of integrating an overdrive 6th gear while still maintaining good driving performance by adjusting functionality, gear and torque to suit current conditions. AWD with Instant Traction  a world innovation The third ingredient in the new Volvo Cars V8 powertrain is the electronic AWD four-wheel drive system, which now features Instant Traction. This new technology  which Volvo Cars is the first automaker in the world to introduce  improves the scope for quick getaways and provides enhanced traction on slippery surfaces. It has been developed by the Swedish company Haldex. A non-return valve allows us to use software to control the base torque that is programmed into the AWD system. When starting off from standstill, 80 Nm of torque is pre-charged in the system since the non-return valve prevents the unit from becoming totally drained of hydraulic fluid. This reduces the usual wheelspin of about one-seventh of a turn that the current system permits before the power is delivered to the rear wheels, explains Jörgen Svensson. Specific V8 exterior design Masculine without being macho, powerful without being aggressive. That was how Volvo Cars chief designer at the time, Peter Horbury, characterised the appearance and stance of the Volvo XC90 at its launch in 2002. On the new XC90 V8, a V8 badge appears in the grille and on the tailgate to indicate the power under the hood. But there are also other design details that set the XC90 V8 apart. Volvos design department has also took considerable care over the appearance of the engine itself. 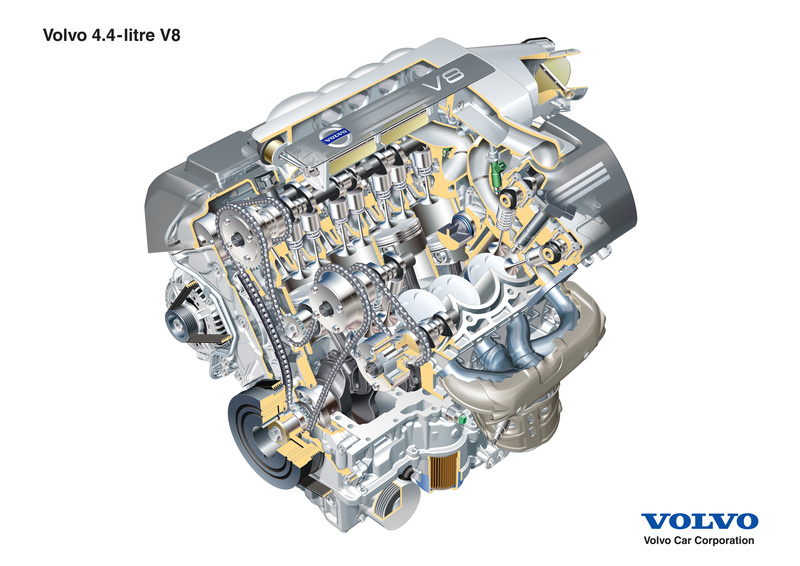 The V8 is the first example of a new design language for the engine compartment in Volvos coming models. We want there to be no doubt that this is a V8, and a modern and technically advanced V8 at that. We therefore chose not to hide the engine beneath large covers but instead to enhance the V-configuration and the eight inlet pipes, says Anders Myrberg, head of engine compartment design at Volvo Cars. On the inlet manifold, Volvos classic iron symbol can be clearly seen in relief against a background of brushed aluminium and complemented with an elegant V8 emblem.